YES! I want to join the Burn The Fat Inner Circle for 12 months so I can start burning fat and get support along the way. Thanks for the 8-week trial period and 100% money back guarantee, too - that takes all the pressure off my decision. I understand that when I place my order, I will be immediately directed to the new member registration page, where I can choose my own user name and password, which I will use to log into the private members-only Inner Circle site, any time I please, 24 hours a day, 7 days a week, 365 days a year. I understand that I will get instant access so I can get started ASAP! Wait, Would You Like to Add The Burn The Fat, Feed The Muscle E-book To Your Order? "Burn the Fat, Feed the Muscle" (BFFM) is a 340 page fat burning success manual in e-book format, jam-packed cover to cover with all the fat loss methods previously known by only by an elite group of top fitness models and bodybuilders. In 144 countries all around the world, tens of thousands of people call Burn The Fat, Feed The Muscle their “Fat Loss Bible”... that's because in one place, you get all the information you'll ever need to help you melt away body fat permanently without losing muscle and without using risky and dangerous drugs or expensive and unnecessary supplements. How to increase your metabolism and turn your body into a food-incinerating, fat-melting human blast furnace! Easy metabolism-boosting techniques revealed! The #1 most effective way to burn body fat ever... If you could only make one change to your current diet program to MAXIMIZE your fat loss, this would be it! The psychology of permanent fat loss... Goal setting and motivation tactics that program your subconscious mind for massive success...Follow this "secret mental training formula" and you'll be practically "hypnotized" into eating properly and working out consistently! And that’s just a tiny fraction of what you’ll learn in this information-packed "bible" to a leaner, more muscular body. You have the same no-risk, money-back offer on this all-time best-selling ebook as you do with all Burn The Fat products. Take a full 8 weeks to use these fat burning techniques. I guarantee you will be satisifed with the program and amazed with your results. PLUS - With Burn the Fat, Feed the Muscle, You Get Four Free Bonus Reports! When you order the Total package, you also get the 4 bonus reports pictured below - FREE! 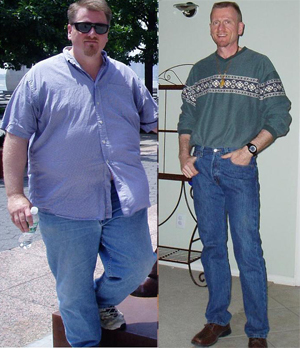 "Before: 296 lbs And 45% Body Fat. After Burn The Fat, Feed The Muscle: 174 Lbs And 6.7% Body Fat!" "Burn The Fat, Feed The Muscle (BFFM) was exactly what I needed to break through and permanently burn off my unwanted fat. I picked up the program during a weight loss plateau - exactly the point where I usually quit. The mindset and goal creation exercises were exactly what I needed to get headed back in the right direction. BFFM is a comprehensive text book of nutrition, training, and motivation all acting in synergy to produce results beyond what I ever dreamed possible. Thank you Tom! YES! I want the Total package! I understand that with my order I will get the 12 month Burn The Fat Inner Circle membership AND the Burn The Fat, Feed The Muscle 340 page ebook in this special combined package deal. I also get the 4 bonus reports for FREE: (1) How to measure your body fat in the privacy of your own home, (2) The A food B Food Lecture: How to get good grades on your food choices, (3) Foods that Burn Fat!, and (4) Foods that Turn to fat!